or another hub. It can work on Windows 7, Vista, XP, 2003/2000/ME, Mac OS X and various Linux kernels without additional driver. 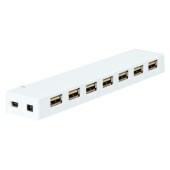 Support USB 2.0 high speed mode 480Mbps, supports USB 2.0 full speed 12Mbps. Support to connect seven USB devices simultaneously. Support OS:Windows 98SE,Window Vista, Window XP, Window Me, Win2000, Windows 7,Windows 8,Mac OS X v10.8.